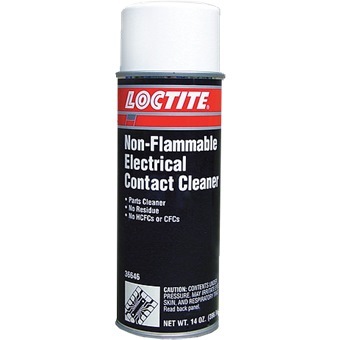 Loctite ® Electrical Contact Cleaner, removes grease, oil, and contaminants from electrical parts to prevent contact failure. Dries residue -free in seconds. Non-conductive, non-corrosive, non-flammable. Contains no CFCs or Class I ozone-depleting chemicals (ODCs). May attack some sensitive plastics.